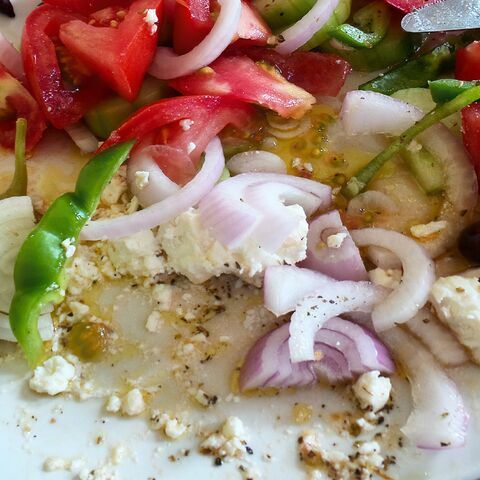 I’ve often heard that a mediterranean diet is the healthiest. Sure I guess, if you have more self-control than I do and can stop yourself from sopping up every little bit of olive oil drenched deliciousness with every last crumb of fresh bread that comes with every dish. And good luck avoiding the many bakeries that seem to occupy every other storefront, filled floor to ceiling with smells of spinach pies, sandwiches, and sweets. 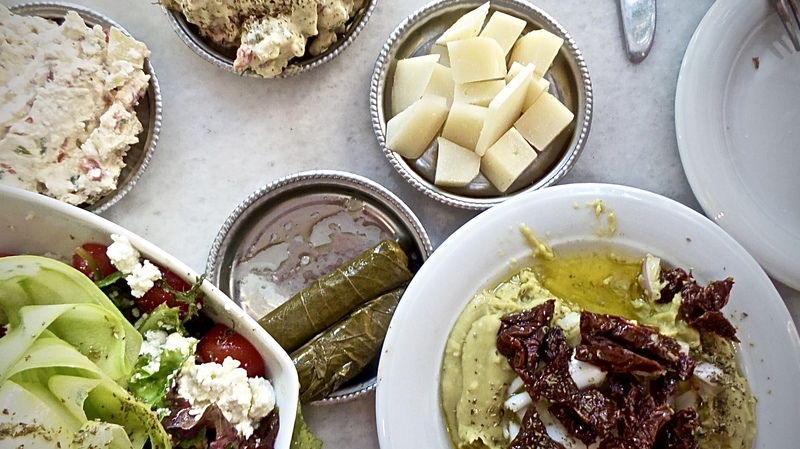 Some of the best greek foods I’ve had have been the staples that everyone knows and the homemade versions always win. 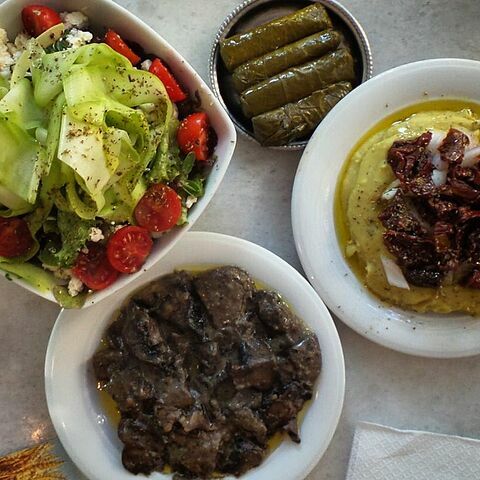 In Greece, mom’s cooking is always the best. I suggest you make some Greek friends. 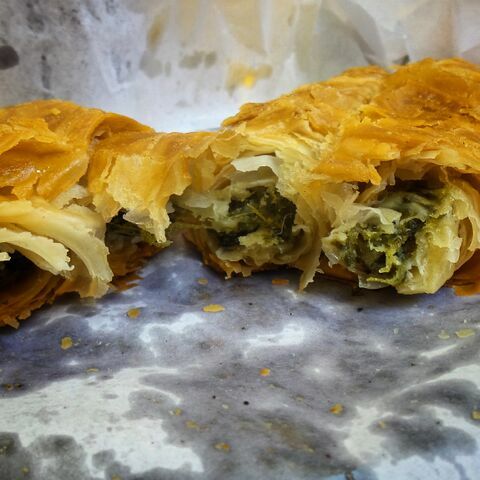 Spanakopita, spinach pie, is easy to find, easy to eat. Perfect when you’re on the go. Flakey, dense pastry wrapped around soft lemon flavored spinach. Koulouri can be found on any street corner and in every bakery. 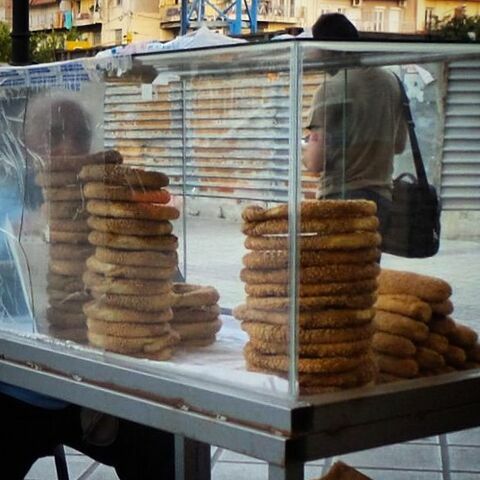 You can always see people walking around in the streets snacking on these chewy, sesame covered, classic, Greek bread rings. 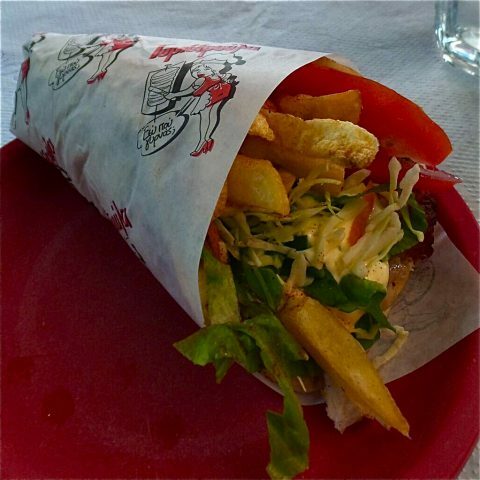 Another obvious go to is the fast food souvlaki. Easy to find, always delicious, it’s the equivalent of getting a burger in the states. 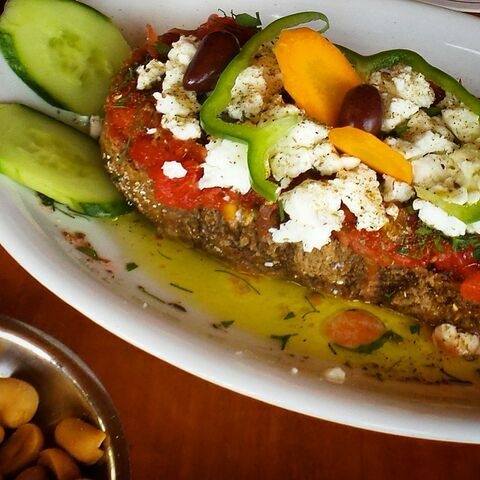 Served either on its own or wrapped in pita and stuffed with tzatziki and fries. 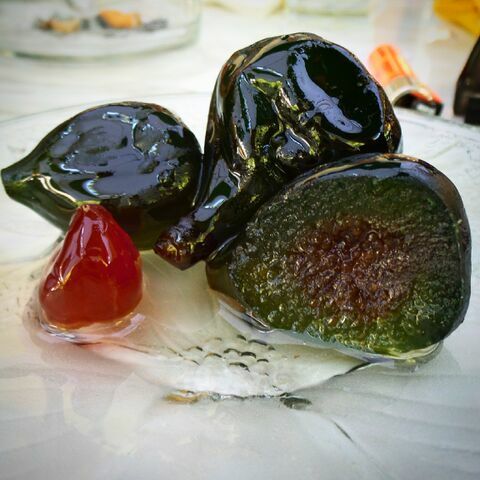 Good luck not devouring one of these after a long night of drinking raki in Greece’s very thriving nightlife scene. And olives. 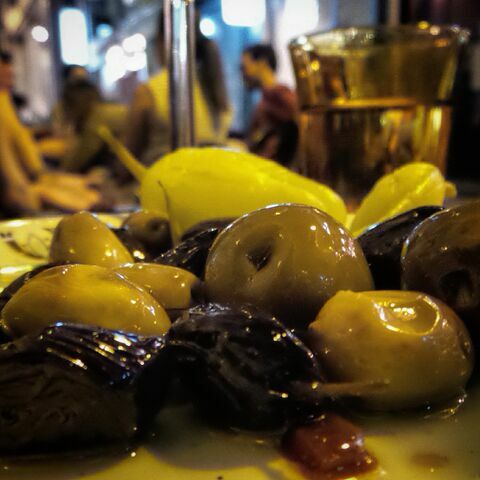 So many types of amazing olives. 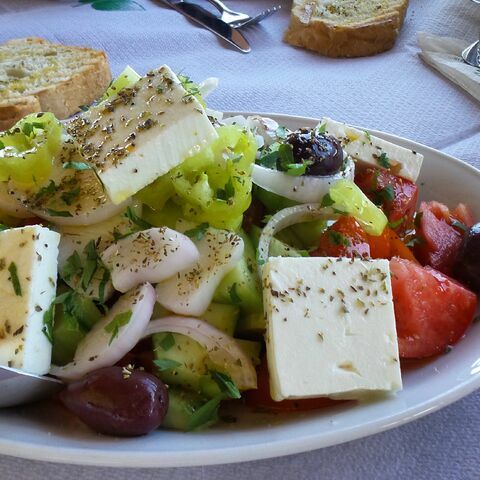 Traditional Greek salad may seem boring and simple but when you’re using the best olive oil that tastes like real olives with fruity notes and a slight bitterness that plays off the sweetness of the brightest, fullest flavored tomatoes, crunchy cucumbers, green bell peppers, most fragrant, fresh, oregano, and salty, creamy feta, it’s hard to beat. Do not forget to smear your bread into the flavor infused liquid that pools at the bottom of the plate. 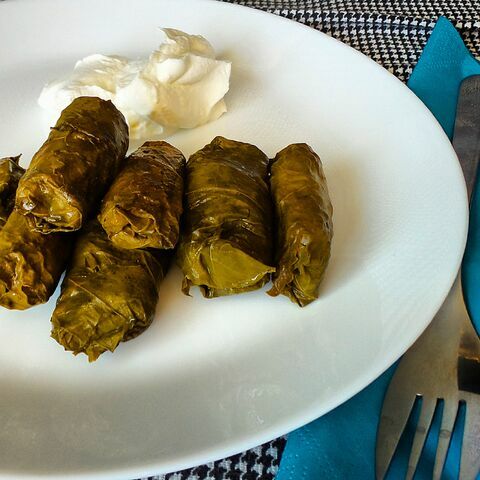 Stuffed gialantzi are grape leaves wrapped around rice. I like them best laced with thick, strong parsley and yoghurt sauce on the side. All the fresh seafood is great. 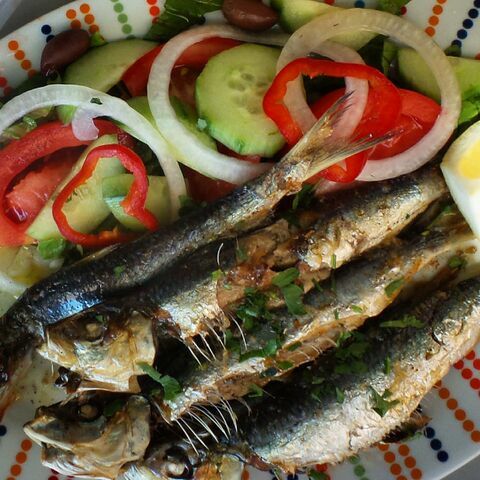 The mediterranean is known for its oily fishes like sardines. They are best prepared simply on the grill. 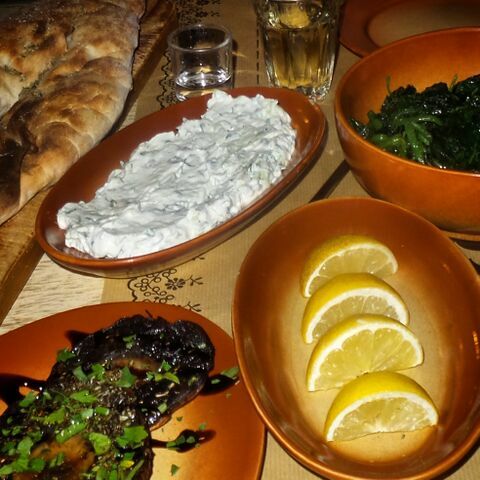 Everything is served with olive oil, herbs, and lemon, lots of lemon. Dakos is crunchy bread soaked in, you guessed it…olive oil, and smothered with seasoned, crushed tomato, fennel, and cheese. 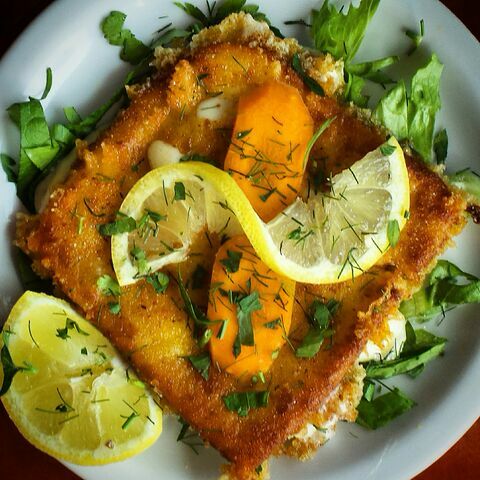 Saganaki, a fried cheese is salty, thick, chewy perfection. Some herbs and little lemon on top is all that’s needed. Meat! 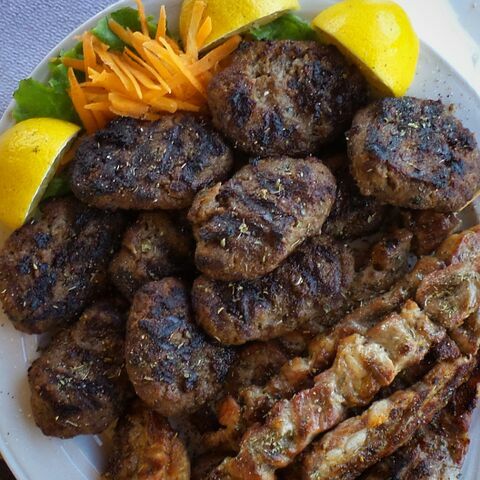 There is a lot of meat in Greece. Lamb, goat, beef, pork, they have it all. Beef meatballs called soutzoukakia, are soft and juicy in texture, and one of my favorite dishes. 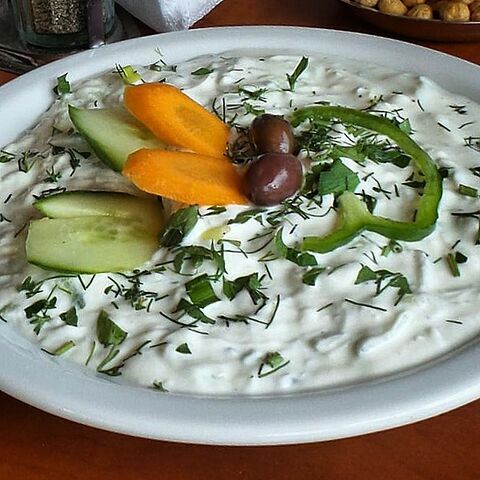 Just don’t forget the tzatziki to go with it, a delicious yogurt mixed with cucumber, garlic, and herbs such as dill, mint, or parsley. It’s perfect with meats or as a starter with bread (of course), or all the time with anything…as I’ve found out. Sides of cheese, fava puree, or simple roasted vegetables like mushrooms, potato, green beans, eggplant, and hearty, cooked, local mountain greens round out a perfect, rich and filling meal. And then there’s dessert. You won’t have room for it, but make room. 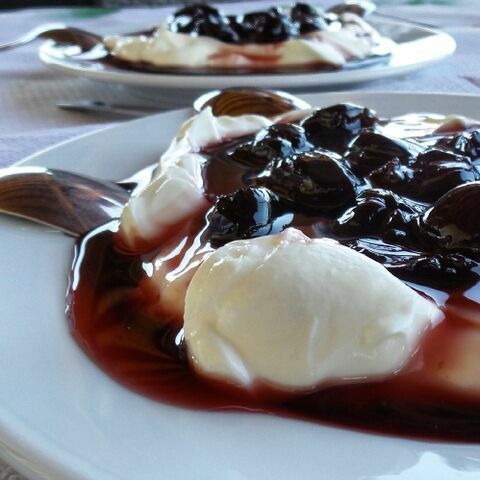 Just a small plate of fruit soaked in sweet syrup or thick, creamy yogurt topped with seasonal fruit or honey is all you need to propel you in to a full-blown food coma.